Families throughout Canada show their moms the love on the second Sunday in May each year. Mother's Day in Montreal means leisurely brunches, spring flowers on full display, and special occasion festivities. Mother's Day in Montreal should definitely start with flowers. Montreal's public markets burst with springtime floral options, especially the Atwater Market and Marché Jean-Talon, which both sell hanging plants, potted flowers, and cut-flower bouquets. While you browse, consider picking up something salty—raw milk cheese, maple cured salmon, samosas—or sweet—baklava, cake, berries—at one of the many artisanal food vendors for a picnic in the park. Mother's Day brunch remains the quintessential expression of appreciation. Treat her to the best brunch in Montreal so she can sit back, relax, and let someone else can cook, clean, and dote on her for a change. Be sure to make reservations well ahead of time as this is the busiest restaurant day of the year. After you eat, take Mom for a digestive stroll at one of the city's many beautiful spots, such as Mount Royal Park, St. Joseph's Oratory, Parc Jean-Drapeau, or Parc la Fontaine. 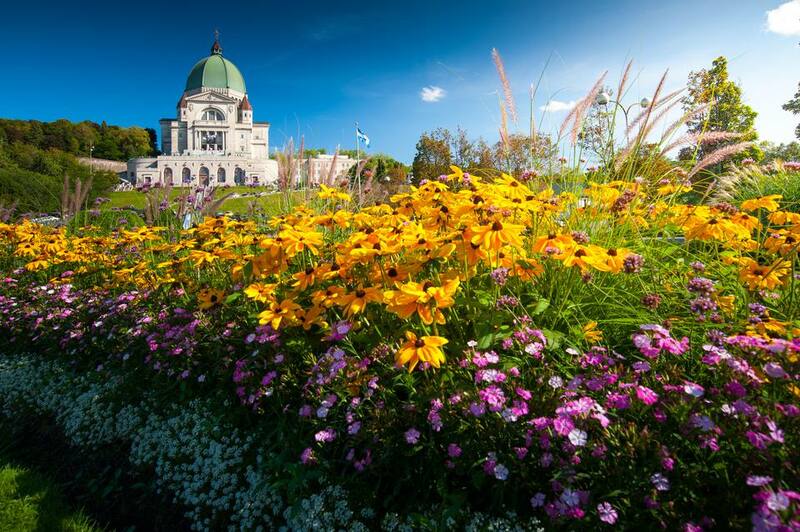 Or head to the Montreal Botanical Garden for a longer walk among your choice of 30 themed gardens set on 75 hectares. With luck, the arboretum's cherry blossoms could be in full bloom. Take a free-spirited mom to the Tam-Tams, a colorful gathering of drummers, dancers, slackliners, performance artists, crafts vendors, and spectators and a Sunday tradition in Mount Royal Park in Montreal's warmer months. You could even prepare a picnic for the occasion. Make a beeline for the angel statue, then follow the drum beat to get there. Did you choose long-lasting potted flowers over ephemeral bouquets for Mother's Day? Take your gift one step further and transplant the flowers into Mom's garden. You can fertilize them with the free compost made available by the city of Montreal every Mother's Day weekend. In many ways, a traditional afternoon tea experience can be even more meaningful than a standard brunch. The tiered platters of finger foods, dainty desserts, and scones with clotted cream make for a special occasion. Drinking tea in the afternoon doesn't have to be a formal affair, but if Mom looks for a reason to dress up, you can indulge her with a time-honored high-society meal. The city's tea houses range from casual to ceremonial, with some fusing Asian and British customs and others serving a heartier working class-style menu. Dazzle your mom with a spa experience far from ordinary. Dreamy chocolate baths, sensory deprivation, and Nordic water circuits at Montreal's top spas relax the body, quiet the mind, and rejuvenate the soul.